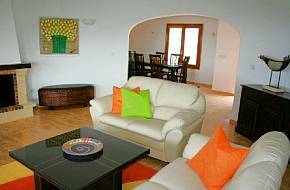 Spain - on the Costa Blanca near Denia and the village of Oliva, Pego and Javea. The property sleeps 10-12. 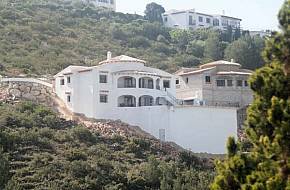 Fantastic, brand new large villa on 2 levels, all day sun, air condition, 5 bedrooms 5 en-suite bathrooms, fantastic sunsets over mountains and seaviews, located in Monte Pego. This two-level, air-conditioned, star villa sleeps 10-12, has 5 large luxurious bedrooms, with en-suite bathrooms. Professionally decorated interior features circular living room, dining room, 3 BR w/ 3baths and large eat-in kitchen on main level. Interior stairs to the lower level has 2BR w/ 2 bathrooms, and TV-party room which walks out into very private spacious terrace with all-day sun exposure and 5 by 10 meter pool, with outside shower, and pool-side BBQ. Reception living area seats 12 & dining area seats 12. Local sports golf, sailing, scuba diving, water skiing, climbing, windsurfing, cycling, tennis, walking, horse riding, jet ski, go-karting, aqua park, sports complex, trekking, snorkelling, swimming, bird watching, flora & fauna, sea fishing, gymnasium & health clubs. Many beach and sport activities nearby, 5 golf venues within 15-40 minutes, Coastal Sightseeing, colorful fiestas, visiting interesting caves and castles, flea markets, daily local open markets General: Ceiling fans/ heaters in each bedroom, A/C and heating in main level, bed, bath and house linen, maid service by request, off-street or driveway parking Outdoors: Wrap around balcony in main level, garden, patio, poolside furniture, poolside BBQ, utility area, circular stone-paved driveway. Denia port includes a fishing area, yacht club and marina and is divided into two, completely different sections known locally as Marines and Rotes. The most crowded and popular beaches stretch more than ten kilometers towards the north. They have full facilities including summer beach activities such as windsurfing, parasailing, jet skies, and much more. In addition to a ferry service to Ibiza, the port has dinghy, sailing and diving class facilities, plus boat rental. The coast to the south of the port against the backdrop of the Montgó nature reserve is characterized by cliffs and rocky inlets with clear waters that stretch as far as the San Antonio cape natural marine reserve: the ideal setting for diving enthusiasts. Sailing, golf, natural landscapes, leisure activities, etc all add to up make Denia the perfect holiday destination. Tourist Information www.comunitatvalenciana.com America’s Cup http://americascup.comunitatvalenciana.com Bonfires of San Juan: Three 'bonfires' or commissions exist in Dénia the “Foguera El Bassot”, the “Foguera L'Hort” and the “Foguera Les Portelles”. In spite of the fact that the papier mâché monuments are the most common things to be burnt on the night of San Juan, there are still places, such as the street of “Les Portelles”, where the tradition of burning something old is still kept. Music invades the city and, after the pilgrimage to the hermitage of San Juan, open-air dances, games and a procession are celebrated.